Joleen Oleson in KNOM’s Studio A. Photo: Laura Collins, KNOM. Friday-afternoon deejay Joleen Oleson knows Alaska quite well. Born and (mostly) raised in Nome, Joleen’s spent time all over the state – in Metlakatla, Barrow, and Fairbanks – and has also called Pittsburgh, Pennsylvania, home. 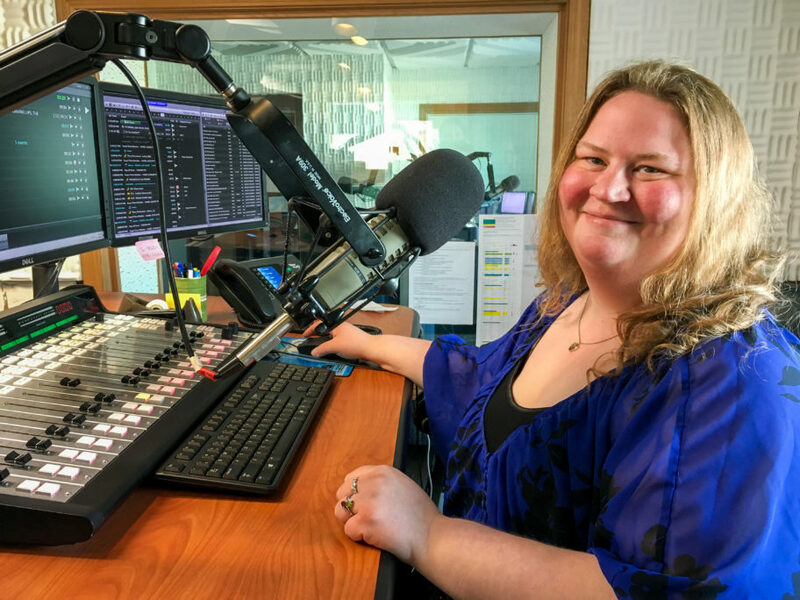 She got involved with KNOM while still in high school in Nome and, in October 1999, started co-hosting “Musical Alternative” with KNOM volunteer alumnus Paul Rauch. She’s been involved with the station in most of the years since then. These days, you can listen to Joleen host “Lost in the 80s” every Friday, 2-4pm. Joleen keeps active in her hometown. She works for the nonprofit Native organization Kawerak, Incorporated, and also serves as president of the Arctic Native Brotherhood. As the host of a radio music show, Joleen, of course, ranks listening to music high in her list of hobbies: especially when it’s The Pixies, Ani DiFranco, Tegan and Sara, or Rufus Wainwright. She also enjoys reading, playing cards, and spending time with family.